Written by CMOS Bulletin SCMO on December 22, 2017 . Posted in Climate, Other, What's Current. As members of a community that works with climate-related measurements and models on a day-to-day basis, we know from first-hand experience that our understanding of the fundamental science that goes into atmospheric and climate model predictions is not complete. Of course, enormous progress has been made but the complexity of the Earth system still limits the accuracy of our climate and air quality projections, especially on regional scales. And we don’t yet know what surprises of unforeseen behavior in our Earth system –– which includes the atmosphere, ocean, land, cryosphere, biosphere and the couplings between them –– await us as the global environment responds to increased greenhouse gas radiative forcing and other forms of pollution. The critical importance of weather, climate, and air quality research to Canada and Canadians is documented in the White Paper on Atmosphere-Related Research in Canadian Universities (ARRCU, http://www.arrcu.ca/). It is for these reasons that the CMOS community has long been lobbying for the continuation of dedicated federal funding in the climate and atmospheric science fields. Starting in 2000 and operating for just over a decade, the Canadian Foundation for Climate and Atmospheric Sciences (CFCAS) funded both small investigator-led projects and also larger research networks in disciplines from air quality to climate to severe weather. When CFCAS was not renewed, there was sufficient groundswell of support for climate science that the federal government created in 2013 the Climate Change and Atmospheric Research (CCAR) program, administered by NSERC. 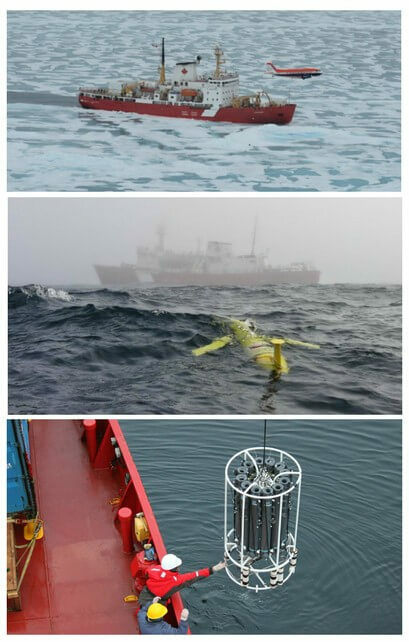 With $35M in funding spread over five years, seven large research networks have been addressing large-scale questions related to atmospheric aerosols and clouds, the biogeochemistry of the Arctic ocean, atmosphere of the high Arctic, seasonal snow cover and sea ice prediction, regional-scale weather and climate processes and prediction, cold region hydrology, and coupling between the ocean and atmosphere. But, once again, just as occurred with the funding gap at the end of CFCAS, with the non-renewal of the CCAR program we are heading into a period of uncertainty with no dedicated funding for research in the fundamental science of global change. Of course, research is still continuing via individual NSERC Discovery Grants, but other federally funded programs are more focused on climate change adaption and mitigation, or links to resource development, with a noticeable absence of funds addressing the fundamental science. In particular, there are no federal programs via which large-scale field measurement or modeling efforts can be mounted (see a recent op-ed in the Globe and Mail from the CMOS Executive at https://tgam.ca/2uPI1kn and articles in Physics Today at DOI:10.1063/PT.6.2.20171127a and at https://doi.org/10.1063/PT.3.3689). The complex field of climate science requires an interdisciplinary, national-scale, collaborative funding approach which is inherently costly to implement, and not conducive to single-investigator Discovery Grant research alone. Moreover, the funding should be sustained. With a funding gap upon us, highly trained personnel are leaving the CCAR research networks, often to other countries or disciplines. This is leading to outcomes in direct contradiction to the stated goals of our governments to promote the development of highly qualified personnel. Within this context, it was heartening to hear that the federal government has recently given eighteen months of additional funding to one of the CCAR projects, specifically to the PEARL facility located at Eureka, NU. PEARL is a highly valuable high-latitude atmospheric observatory. However, the community needs sustained funding, not stop-gap measures of this nature. Nor should climate funding be restricted to Arctic science only. While the Arctic is a bellwether of climate change and Canada should undoubtedly play a leading role in Arctic science, a more holistic climate funding program is needed, one that does not focus exclusively on the Arctic nor one that relies on short-term funding measures. As principal investigators of CCAR projects, it has been truly amazing to see the growth in our fields that arose with CCAR funding. The highly collaborative nature of the networks excited and engaged a new generation of young scientists (according to NSERC, over 370 personnel were trained in the CCAR networks), and leveraged immense resources from our government and international collaborators. The impact of our science was recognized by the international science community. We also know that there is a wealth of untapped scientific talent in our community – from recent faculty hires, from established researchers not funded under CCAR, and from young scientists eager to move into this field. What better way to take advantage of Canadian strengths in this area than to have a sustained source of peer-reviewed funding available in a field that underpins our ability to formulate wise policy decisions? The Minister of Science has referred to CCAR as a “one-off” solution to climate science research. It would not be so if the government had refunded the program, or returned to the CFCAS model of funding for both large networks and smaller, single-investigator-led projects. Indeed, NSERC recommended that “The federal government continues to fund fundamental research in climate change and atmospheric processes through NSERC’s CCAR initiative, as long as these areas remain priorities for the federal government.” (www.nserc-crsng.gc.ca/_doc/CCAREvaluation_e.pdf). We encourage you to write to the Ministers of Science and Environment, and to your local member of parliament, stating your thoughts on this issue. 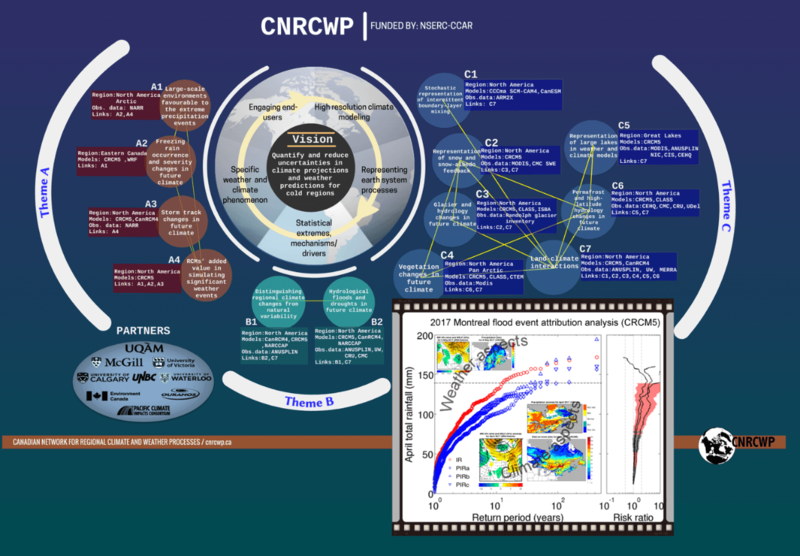 Summary diagram of the Canadian Network for Regional Climate and Weather Processes, showing diverse research themes and projects. Lower right: analysis of weather and climate factors contributing to the 2017 Montreal flood, performed with the fifth generation Canadian Regional Climate Model (CRCM5). Credit: CNRCWP.